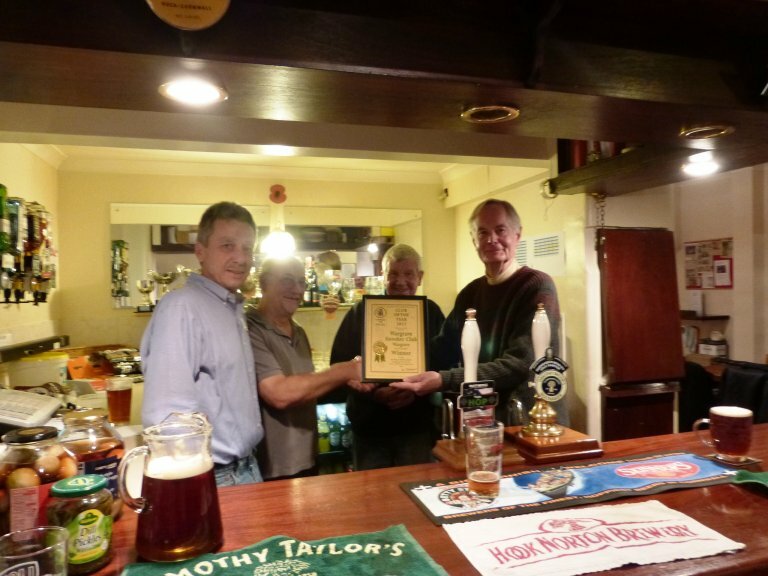 Last night, former Reading & Mid-Berks CAMRA Chairman and local Wargrave resident John Robinson presented the certificate for Club of the Year to the Wargrave & District Snooker Club. It was received by Graham (Bar Manager), Steve (Chairman) and Mel (mentor and ex-Bar Manager). Shortly after the presentation, the Timothy Taylor Boltmaker ran out and, to celebrate the special occasion, we were treated to some Brakspear Special - which Graham had collected personally from The Bell Street Brewery in Henley. The Bell Street Brewery is a micro-brewery which sits within Brakspear's newly-redeveloped Bull on Bell Street pub. Those present all raised their glasses to the ten years of the club being named the Reading & Mid-Berks Branch of CAMRA’s Club of the Year. CAMRA members are welcome at the club bar which opens Monday to Friday evenings, 7 to 11.